Coppicing is an ancient form of woodland management that involves repetitive felling on the same stump, near to ground level, and allowing the shoots to regrow from that main stump (also known as the coppice stool). Most shoots come from above ground, but in hazel they can emerge just below the surface. Centuries ago, hedges England and Europe were coppiced and laid about every 8 to 20 years to provide renewable supplies of firewood and reliable stock-proof enclosures. In England, the availability of cheap coal in the C19th made hedge-coppicing largely redundant but farmers were often still willing to lay their hedges to maintain a dense structure. 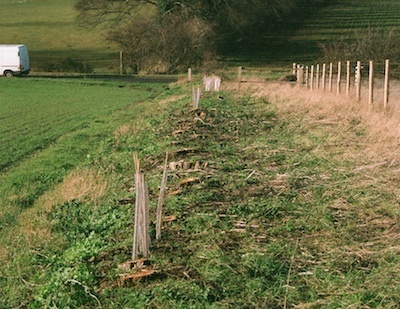 Appropriate trimming will maintain hedgerows in good condition and prevent spreading for many years but from time to time some restoration work is needed in order to encourage new growth at the base of a hedge and keep it thick and vigorous. Coppicing is best carried out in winter. 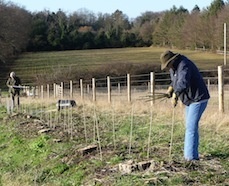 The hedge is cut low to the ground as possible.The new growth is trimmed for the next couple of years to encourage a dense base. Trimming hedges with a flail is the most common and convenient way of managing hedges. Recent research in Cambridgeshire has shown that cutting every third winter instead of annually will produce well-structured and dense hedges producing 2.1 times more flowers and 3.4 times the mass of berries compared to annual cutting benefiting pollinating insects and over-wintering birds.